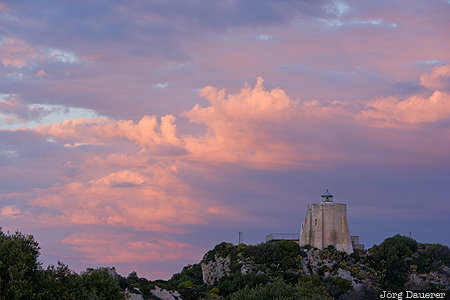 Colorful sunset clouds above the lighthouse at Capo Milazzo (Faro di Capo Milazzo). Milazzo is in the north of the Mediterranean island of Sicily, Italy. This photo was taken in the evening of a sunny day in March of 2017. This photo was taken with a digital camera.